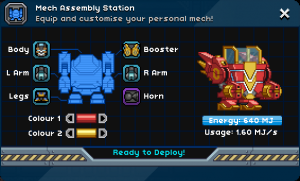 Vehicles are items which can be 'driven' and can allow the player to move quickly. Vehicles are summoned using controllers which store the vehicle when not in use. Vehicles take damage and must be repaired by bringing your controller to Rob Repairo at the Outpost to be repaired with Auto Chips. If the vehicle takes too much damage it will be destroyed and cannot be resummoned until repaired. Both vehicles and players are vulnerable to damage while in use, vehicles can also take damage from player weapons. Hoverbikes can move quickly over ground (even if it's ground at the bottom of an ocean), and their hovering ability allows them to climb some walls. They have room to hold one driver and one passenger, but neither rider can use items while inside these vehicles. Hoverbikes have different controls compared to those of the Player. The Left and Right inputs (usually assigned to A and D) make the hoverbike accelerate toward the left and right sides of the screen, respectively. The Up input (usually assigned to W) causes the hoverbike to raise its nose, while the Down input (usually assigned to S) causes the hoverbike to lower its nose. The Jump input (usually assigned to Space) causes the hoverbike to "jump" upward by sending an impulse to its thrusters. The Primary Fire input (usually the Left Mouse Button) toggles the headlights, and the Alt Fire input (usually the Right Mouse Button) engages the hoverbike's horn. All colors of hoverbike behave identically, possessing an innate 50% damage reduction and a health pool of 1000. In addition, the passenger gains 100% damage reduction while the driver only gains 85% damage reduction (this replaces damage reduction from equipped armor). While in use, hoverbikes will do their best to hover 3 tiles above the ground (this tendency is why they can climb walls and even some shallow overhangs). They can move horizontally at up to 80 tiles per second (the player's default run speed is 14 tiles per second). These vehicles ignore platforms, a property also possessed by the Spike Sphere. When a hoverbike hits an object at low speeds, a sound will be made, but the hoverbike will not take damage. If, instead, it hits something at higher speeds, such as those attained from a long fall, a crunching sound will be heard and the hoverbike will take 10 defense-ignoring damage. In the case of a long fall, the riders may take fall damage if the hoverbike is falling very quickly when it hits the ground. Regardless of whether they take damage, the riders will have an "Oooh" facial expression for 2 seconds whenever the hoverbike takes damage. If the hoverbike has more than 750 health, it appears undamaged. Both the driver and passenger have a happy facial expression; the driver uses the Warm Hands "dance" while the passenger uses the Typing "dance". The hoverbike will gain some scratches once it is damaged below 750 health. In addition, the passenger will now have an annoyed facial expression. Smoke will begin to emit from the hoverbike once it is damaged below 500 health. The smoke will increase in intensity as the vehicle takes further damage. In addition, the hoverbike will begin to look quite dented, and both the driver and passenger will now have sad facial expressions. The engine sound will change once the hoverbike is damaged below 400 health. The hoverbike will begin to make intermittent explosion sounds once it is damaged below 330 health. These will become more frequent as the hoverbike takes further damage. Fire will begin to emit from the hoverbike once it is damaged below 250 health. The fire will increase in intensity as the vehicle takes further damage. In addition, the hoverbike will begin to look very damaged. The driver will have an annoyed facial expression, but the passenger will perform the Panic "dance" while wearing a "Oh" facial expression. 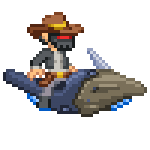 The hoverbike will begin to take 1 defense-ignoring damage every second if it is damaged below 125 health, eventually being destroyed if it is not put back into storage before it reaches 0 health. Boats can move quickly over any liquid (max boat speed is 35 tiles per second, almost double that of an Aqua Sphere in liquid), and they are immune to status effects inflicted by liquids (most notable of these is immunity to Lava's Melting effect). Though they have an innate 50% damage reduction like hoverbikes, they only have a max health of 100, so care should be taken when engaging in combat while standing on a boat. A driver and a bow passenger can be accommodated by each boat, and the deck itself also serves as a platform on which entities can stand. 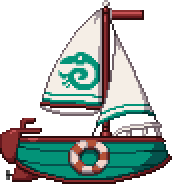 The driver and bow passenger are unable to use items, but this restriction does not apply to players merely standing on the boat deck. Boats can only be moved left and right within a liquid. If they come across platforms in a liquid, they will ignore them. If the boat has more than 75 health, it appears undamaged. The bow passenger wears a happy facial expression and performs the Titanic "dance" while the driver wears a happy facial expression. Whenever the boat takes damage, the driver will wear an "Oooh" facial expression for 2 seconds. If the boat is damaged below 75 health, it will gain some scratches. If the boat is damaged below 50 health, it will begin to look quite dented, and the driver will wear a sad facial expression. In addition, the boat's buoyancy will decrease slightly, and liquid friction will increase, making it harder to move around in the current liquid. If the boat is damaged below 25 health, it will begin to look very damaged, and the driver will wear an annoyed facial expression. In addition, the boat's buoyancy will decrease considerably, and liquid friction will increase some more, making it even harder to move around in the current liquid. If the boat is damaged below 0 health, it will tip over and sink in the current liquid. It will be destroyed when it hits a solid object or when 10 seconds pass, whichever happens first, but it can be recalled to its controller before this happens. 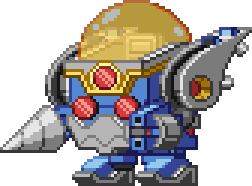 Mechs are vehicles that provide the player protection, adjusted movement as well offensive and defensive abilities. Dr. Akaggy can be found at the Mech Workshop under the Outpost. She will introduce the player to Mechs, and unlock their first, racial-themed vehicle after they complete the quest Test Drive. Also in the Mech Workshop are to important mech stations - the Mech Assembly Station and Mech Part Crafting Table. To purchase either Hoverbikes or Boats, travel to the Outpost and speak to Penguin Pete. Mechs can be unlocked from Dr. Akaggy, and more blueprints crafted at a Mech Part Crafting Table. Buy Auto Chips from the same dealer who sells vehicles (alternatively, obtain them from bonus chests while excavating Fossils). Next to him is a little robot, Rob Repairo, who brings up a menu with a slot for Auto Chips and a vehicle controller. Keep adding Auto Chips until they're no longer accepted. If you bring out your damaged vehicle before it's fully repaired, the vehicle will look progressively less worn depending on how many chips you've spent on it. The chips will be automatically processed once put in their slot, no confirm button necessary. Hoverbike designs were teased in early alpha, though their design changed greatly by the time they were implemented in game. This page was last modified on 18 August 2017, at 00:48.